The Tesla Model 3 is here at last. A lucky few took it for a spin, and it did not disappoint. Volvo also made headlines a few weeks ago, when they announced to exclusively make cars with only electric motors starting 2019. A bold call, which we hope will influence other car manufacturers in the next few years. Based on the new cars launching this year, and between 2018 and 2021, it seems like many of them have already understood the message. Bloomberg just bumped up its 2040 forecast for the global electric-car market share from 35% to 54%. Part of this probably resulted from those ambitious plans by France and UK: both countries will ban all petrol and diesel vehicle sales by 2040! It's safe to say that the era of electric mobility is upon us. So to kick off these electrifying times, we've made a shortlist of fully electric cars that'll hit the European and North American market before 2021. Tesla has finally rolled out its first production version of this long-anticipated car. The first pre-order customer in line actually gave up his spot to Elon Musk as a birthday present. Some other +500,000 in line will probably need to wait till late 2019 before they can get their hands on their own Model 3. The Premium Range model, which goes 500 km/310 miles for just $44,000, has in fact the cheapest price per range ever! (P.S. this handy little infographic lays it out for you). So one thing's certain, the age of electric cars has officially arrived. 2017 has been a full year of winning for Chevy Bolt. 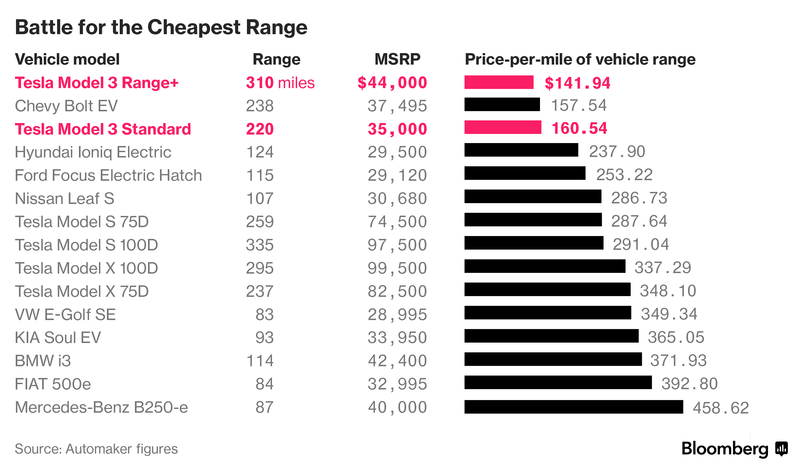 Acclaimed with numerous awards, Chevy Bolt is seen as the biggest contender in the race to mass adoption of (actually affordable) long-range electric cars. Chevy Bolt is already available to a lucky few states in the US, while it’s nationwide roll out is only months away. The European counterpart Opel Ampera-e has already started selling in Europe. Hyundai, which has long championed fuel-cell vehicles, has been under pressure to compete more vigorously in the battery electric market stimulated by Tesla. So earlier this year, Hyundai showed off a full line of electrified Ioniqs at the Geneva Motor Show. The fully-electric model is already on the roads in Europe. It'll become available in the US this winter. Back in 2015, Ford announced it wanted to build some 13 new (plug-in) hybrid and fully electric cars by 2020. Currently though, Ford only offers one fully electric vehicle, the Ford Focus Electric. Its 2017 upgrade is slated to become available before the end of this year. After a few bumps in the road, Henrik Fisker aims to make its comeback with a bang. The first production model of his ultra-luxury sedan is recently released. 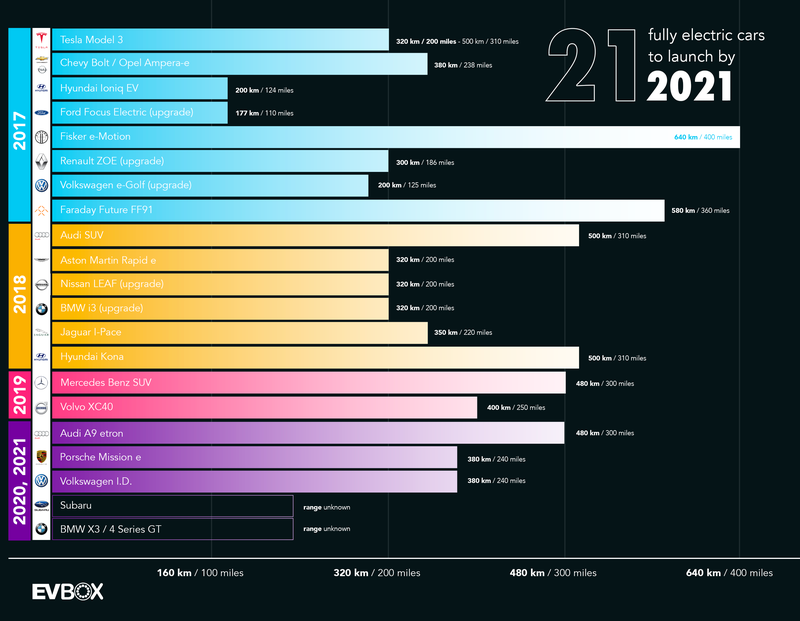 Deliveries are expected in late 2019. ZOE remains the best-selling fully electric car in Europe for yet another year. The 2017 ZOE comes with an improved range. It's already available for orders in the UK and is expected to roll out across Europe the rest of this year. Audi confirmed earlier this year that it was planning to begin production of its first fully-electric SUV in 2018. This new one will be heavily inspired by Audi's e-tron quattro concept, which was unveiled at the Frankfurt Motor Show in September. James Bond is always ahead of his time. But it took a while for Aston Martin to finally develop a fully-electric car. Teaming up with the Chinese tech firm LeEco, the production version of RapidE is expected to roll out in 2018. Undeniably the most seasoned electric-car maker of this bunch. The 2016 LEAF has a range of about 170 km / 107 miles per charge. But there’s speculation that the automaker will roll out a new, upgraded LEAF sooner than expected. The 2017 BMW i3 has a range of 182 km / 113 miles per charge. The 2018 version is expected to launch at Frankfurt Motor Show this September. Set for EU delivery early next year, the upgraded i3 receives a longer range, as well as a number of subtle styling updates. This is Jaguar's very first fully-electric car. The production version will hit showrooms by the second half of 2018. Judging on its performance and terrific looks, seems like Jaguar I-Pace will likely become the first real competition for Tesla’s Model X. At the Paris Motor Show last year, Mercedes showed off its Generation EQ concept car, an electric SUV (yep, there it is again). This concept is slated to go into production in 2019. In addition to the Audi SUV anticipating sales in 2018, Audi has also kickstarted a fully-electric luxury sedan. Audi's take on Tesla's Model S. Reportedly, this car will also feature autonomous driving. Audi's chief has said to offer three EVs in its line-up by 2020. He also plans to have 25% of all Audi cars to be powered by batteries. Who said sports cars can't have silent motors? Porsche, the mother of all sports cars, said to invest some $1.09 billion in new facilities to begin production of its first all-electric car. The Mission e is expected to enter the showrooms by the end of 2020. Trying to recover from the Dieselgate, Volkswagen promised to deliver more than 30 electric cars by 2025. At the Paris Motor Show last year, Volkswagen showed off its I.D. concept car, yet another electric SUV. The production version is due for 2020. In an interview with Bloomberg, the CEO noted that Subaru intends to simply offer plug-in hybrid versions of existing models. So, Subaru’s not taking any big leaps in the near future, but has its eye on a future when battery prices are notably lower. Its first fully electric car is now planned to launch in 2021. BMW has scrapped their i5 plans and will now focus on electrification of other series models like the X3 and 4 Series GT. The latter will be BMW's take on Tesla's Model 3 and is expected to launch around 2020. Subscribe to our monthly updates about the latest in clean tech and electric mobility. For the EVsavvy amongst us, share your thoughts on the latest industry developments on LinkedIn. No time to read? 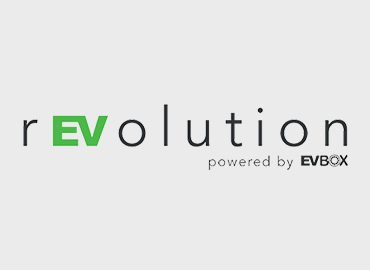 Tune in on Instagram and YouTube for a peek into the wondrous world of EVBox & electric mobility.